New York, 12th Mar 2015 – Digital has emerged as the only media to deliver strong increases in advertising spend across all major international markets, as global advertising data group Standard Media Index (SMI) reported a record level of combined spend from three of the world’s largest markets. But the data also detailed significant variations in demand among the major media within the U.S., U.K. and Australian media, highlighting the increasing complexity of the global advertising market. Standard Media Index, which aggregates actual ad spend data from the world’s largest media agencies, has studied the performance of these top markets using its unparalleled insight into how dollars are moving across the media landscape. Largest percentage growth in 2014: Of the three major markets in which SMI publishes data, the U.K. delivered the largest percentage growth in 2014, increasing by +5.7%, followed by the US (+5.0%) while the Australian market stayed flat. The lack of movement in the Australian market in 2014 was mostly due to the national election held in 2013, lifting government category expenditure to near-record levels for the 2013 year. Fastest growth rate: The U.S. agency ad market was the best performer over the past five years, delivering the fastest growth rate on a compound annual growth rate (CAGR) basis. The U.K. and Australia also enjoyed positive CAGR between 2009 and 2014, which underscores the long-term strength and buoyancy of these advertising markets. Key category trends: SMI’s ten largest global categories also reported combined growth of 4.6% in 2014, exactly in line with the total market. Within those ten largest categories the highest gains came from pharmaceuticals (+11.1%) and telecommunications (+9.9%) with the largest decline in Beauty/Grooming and personal care sector. But many of the smaller categories made up for that loss in bookings with above-market growth, for example, from the fuel and gas utilities market (+32% YOY) and non-alcoholic beverages (+11.8%). Digital: All major markets delivered double digit increases in digital ad spend in CY2014, although the U.S. market’s exponential digital growth (+18.4%) in 2014 was greater than in any of the three markets, and above the combined total (which grew 17.8%). Across the board, spending within programmatic delivered the highest growth in each market. Social networking remains strong globally. In the U.K., it grew by 37.4%. TV: While growth steadily continues in the U.S. and U.K, TV’s share of the total media pie is reducing over time as digital continues its rise. But in all three markets advertisers are increasingly supporting major TV networks’ video offerings. In the U.S., NBC.com and ESPN.com saw rapidly growing investment in the fourth quarter of last year. Cable TV: Advertisers’ spending on cable TV was vibrant in the U.S. and U.K. throughout 2014 but dipped 3.6% in Australia.Cable TV: Advertisers’ spending on cable TV was vibrant in the U.S. and U.K. throughout 2014 but dipped 3.6% in Australia. Radio: Radio delivered higher bookings in Australia and U.K. in 2014, but declined 3% in the U.S. in 2014. Outdoor: Significant growth in outdoor ad spend in the Australian and UK markets (+7.2% and 8.6% respectively) was unable to be replicated in the US (14.0%). Newspapers: To round out 2014, there was a glimmer of hope for the newspaper industry in the U.S. It recovered slightly from their consistently poor results with a 1.6% increase for the year, but Australia and the U.K. didn’t follow. 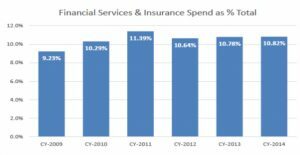 Financial Services: Spending by financial services advertisers remains buoyant globally across these top three markets (growing 4.9% collectively in 2014), which also meant the category slightly grew its share of total spend. SMI captures national media spend across the U.S., U.K. and Australia, gathered exclusively from the booking systems of five of the six global media holding groups, as well as leading independents. 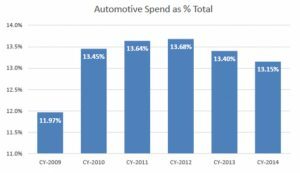 It reports monthly on actual ad spend data and is the clearest picture of the flow of dollars across the sector. All figures shown in this release are based on USD denominated amounts. SMI captures 80% of total U.S. agency spend exclusively from the booking systems of five of the six global media holding groups, as well as leading independents. It reports monthly on actual spend data and is the clearest picture of the flow of dollars across the sector.